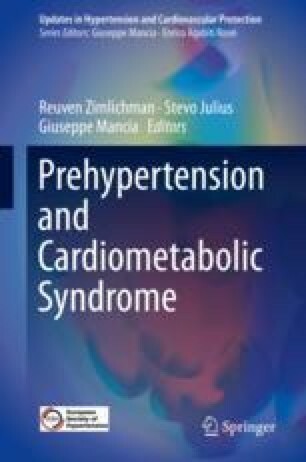 In the Seventh Report of the Joint National Committee (JNC-7) on prevention, detection, evaluation, and treatment of high blood pressure in 2003, people with systolic blood pressure between 120 and 139 mmHg or diastolic blood pressure 80 and 89 mmHg were categorized as having prehypertension. Besides being a precursor to high blood pressure, prehypertension itself is associated with increased risk of cardiovascular disease. It appears that nearly one-third of the world’s adult population have prehypertension. Its prevalence seems to decrease in high-income countries while still rising in countries with low- and middle-income. Prehypertension is more common in males than females. Almost 90% of individuals with prehypertension have at least one other traditional cardiovascular risk factor. Multiethnic comparison studies on prevalence have produced contradictory evidence. Fifteen years after its first introduction, data suggest that physicians are reluctant to tell patients they have prehypertension. World Health Report 2002. Reducing risks, promoting healthy life. http://www.who.int/whr/2002/ Accessed 27 June 2017. National Institute for Health and Care Excellence. Hypertension: clinical management of primary hypertension in adults (Clinical guideline 127). http://guidance.nice.org.uk/CG127. Accessed 27 June 2017.
WHO Global Observatory data. http://apps.who.int/gho/data/view.main.12467GLOBAL?lang=en. Accessed 22 June 2017.